You will get lifetime experience during 30 to 45minutes flight. If you can not manage two days for this hair-rising sport, the tandem flight is also available. Pilot will give you some explanation about the flight and he will also allow some hands-on control of the glider. You can enjoy the beautiful scene of the mountains by the short flight from Sarangkot. You enjoy the beauty of Annapurna range and splendid landscapes around Pokhara valley, virgin Mt; Fishtail (Machhapuchhre), Lamjung Himal, Annapaurna Himal, Himchuli, Fewa Lake, Rice field, Rivers and settlements are below gives you thrills with a great photographic opportunity. 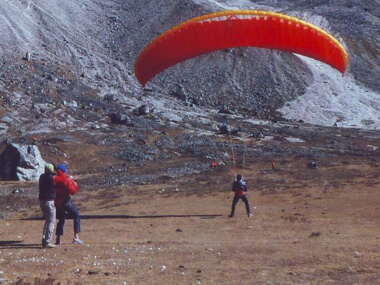 Fly once in Pokhara will definitely be one of the best experiences in your life. Sarangkot is best known as the perfect place in Nepal. We drive there early in the morning. You will be briefed about the flight by the expert and professional pilot upon arrival there. After an hour’s exciting flight, you will see breathtaking views of Annapurna Range, beautiful Mt. Fish Tail, Annapurna South, Himchuli, Annapurna II, III, IV, Lamjung Himal, Mt. Manaslu and great Mt. Dhaulagiri together with landscape panorama and Fewa Lake.